Percy Horton (1897-1970). Horton was born in Brighton and attended the School of Art there from 1912-1916. During the First Word War he became a conscientious objector and was sentenced to two years hard labour in Carlton Prison, Edinburgh, from 1916-18. After the war, he took up his studies again at the Central School of Art 1918-20 and the Royal College of Art 1922-24. In 1925 he was appointed art master at Bishop's Stortford College and also began giving classes at the Working Men's College in London. As a member of the AIA (Allied International Artists) during the 1930's he believed that artists should be socially committed and he painted a series of portraits of the unemployed during the Depression. He taught at the RCA between 1930 and 1949. During the Second World War the college was evacuated to Ambleside and he produced a series of paintings of the Lake District and its people. At the request of the War Artists Advisory Committee he drew portraits and painted scenes in war factories and this collection is now in the Imperial War Museum. In 1949 Horton was elected Ruskin Master of Drawing at Oxford University and remained in this post until his retirement in 1964. His favourite areas for his paintings were the South Downs around Firle and the farmsteads of Provence. His style was restrained and traditional; in 1973 came this quote - "the landscapes of his maturity are carefully composed and closely observed, the artist's strong sense of form and pictorial structure making them serious works which require time to assimilate and appreciate. As a figure draughtsman, he was outstanding and his portrait drawings and paintings are the work of a sensitive artist of intense concentration, intellectual power and human understanding." 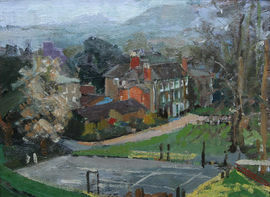 Percy Horton painted many scenes of Dulwich . He and his wife, Lydia lived at 11 Pond Cottages for many years. His neighbours were fellow artists James and Margaret Fitton who lived at 10 Pond Cottages. After the Hortons left the two cottages were amalgamated and the Fittons took over the entire property. One of Horton's pupils at the RCA was the Canadian-born artist, R.B. Kitaj, who also lived in Dulwich, in the 1960's, in Burbage Road. Horton exhibited in numerous group shows, including the Royal Academy Summer Exhibition, Arts Council travelling exhibitions, Royal Society of British Artists, New English Art Club, Ashmolean Museum and the Brighton Art Gallery. A memorial retrospective was held at the Mall Galleries in 1971. His work may be seen in the permanent collections of the Tate, National Portrait Gallery, Arts Council, Fitzwilliam Museum, Cambridge and a number of city art galleries.